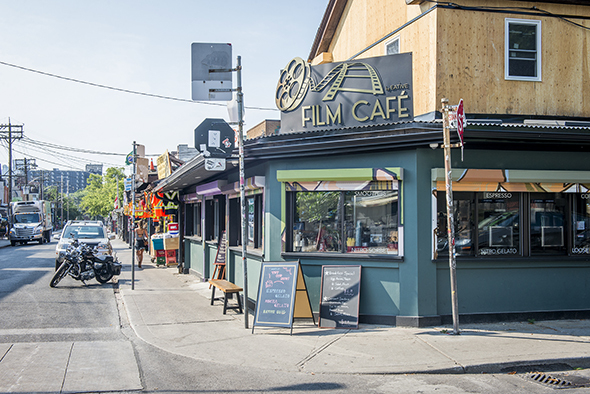 Eative Film Cafe was once a small, one-stall operation that only served gelato. They've since expanded from 228 Augusta to fill the entire impressive space next door. 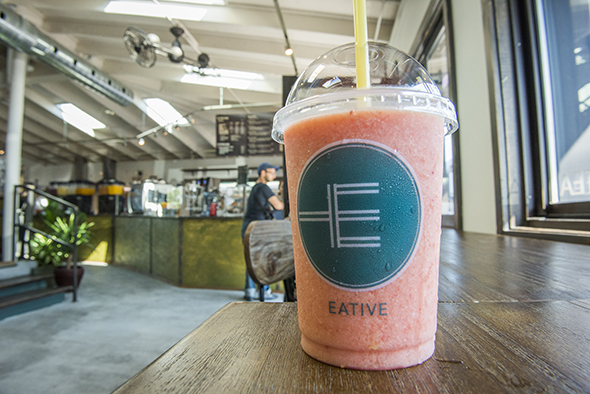 Eative now has much more on hand other than ice cream in this expanded location, such as fruity smoothies and nitro brewed coffee. They're also doing breakfast and lunch with a short menu of items that borrow from Asian street food concepts while keeping it simple with more familiar North American ingredients. The interior is airy with cool ceiling fans and tons of windows, making it bearable in the summer and cozy in the winter. 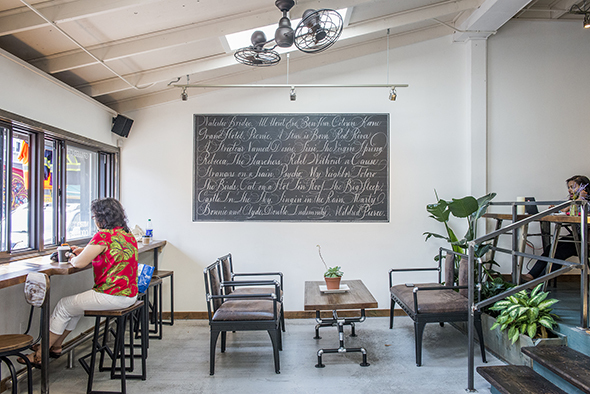 There's plenty of seating and tons of outlets for laptop workers, at big wooden tables where you can spread out or little bar seats where you can keep to yourself. 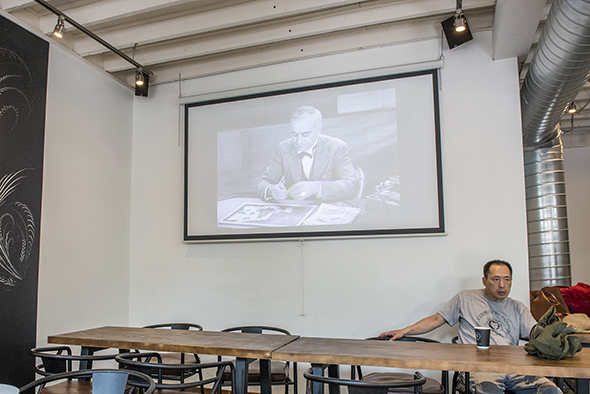 Names of famous old movies are written on one wall, and a projector plays silent films on the other. We try the Berry Sensation ($6.50) and the Bloody Orange ($6) smoothies. The Sensation is a mix of berry purees and juices like blackberry, cranberry, raspberry, blueberry and pomegranate, and the Bloody is orange and mandarin juices with some berry juice. French Vanilla that gives the smoothies an extra kick and balances tart flavours with creaminess. The nitro cold brew ($4) is also to die for, if you're into that kind of thing, which you should be. The team here, headed by former chemist and owner John, has had to invent their own scaled-down equipment for safely fusing nitrogen into their cold brew. They use the same equipment for their "dragon's breath" ice cream which melts and creates steam in your mouth when scooped in with a sort of Chinese churro. 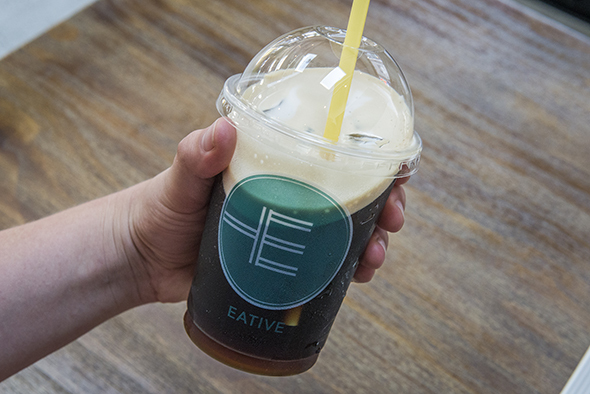 Most of Eative's food is a take on Asian street foods with familiar Canadian ingredients. 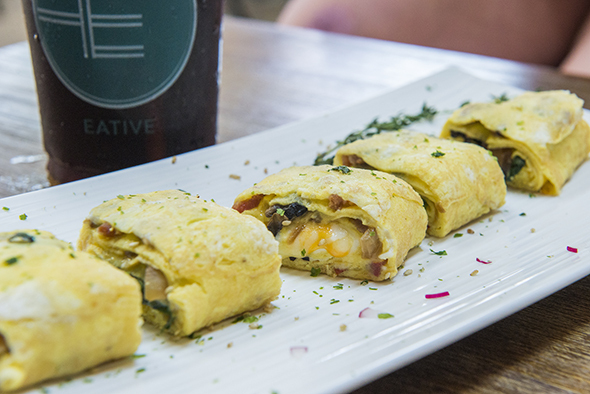 The Japanese rolled omelette ($10.99 is rolled in thin layers in a traditional Japanese style, but within the layers are bacon, old cheddar, sun dried tomato, sour cream, onion, mushroom and sriracha. 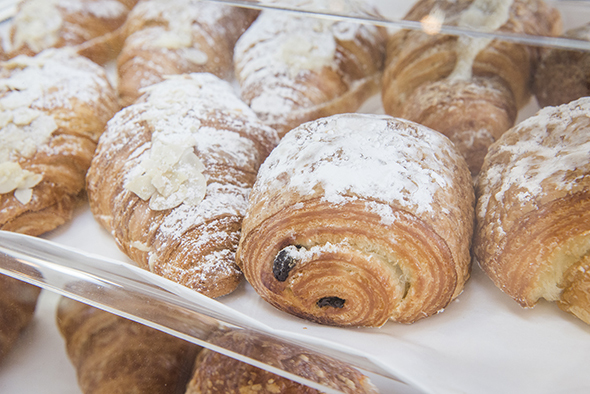 If you need something quick on the go and just barely have time for an espresso (it's not all about the liquid nitrogen here - they also have hot coffee, made with their own blend created by Social Coffee) they also stock pastries by Circles and Squares . They now also have regular film-related events at this cafe, including a curated documentary series. 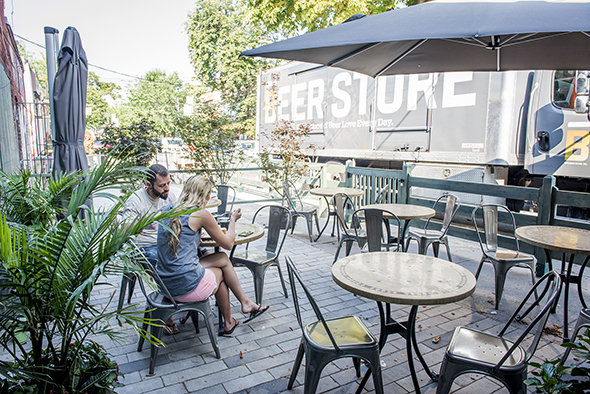 The expansion also came with a patio with plenty of tables and umbrellas. This makes it a nice shady place to enjoy the wider variety of offerings.